. 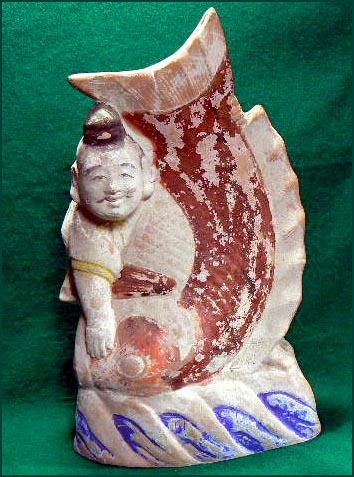 yakusugi 屋久杉 cedar art from Yakushima island .
. Kawanabe Butsudan 川辺仏壇 Buddhist Family Altar . The first hand balls were made to be thrown in the air and catched, but these toy balls from Amami island were made to be dipped on the floor. So they are made from very strong cotton. The textile is mainly used for kimono materials, ties, hand bags. Silk fabric has been made in Amami Oshima, a suitable place for sericulture, since ancient times. While the dyeing process used on Amami Oshima was the same as that of the Japanese main islands, the native teichigi trees and other vegetation used for dyeing are said to be the roots of modern Authentic Amami Oshima Tsumugi Silk Pongee’s mud and teichigi tree dyeing techniques.
. Introducing tsumugi 紬 silk pongee . 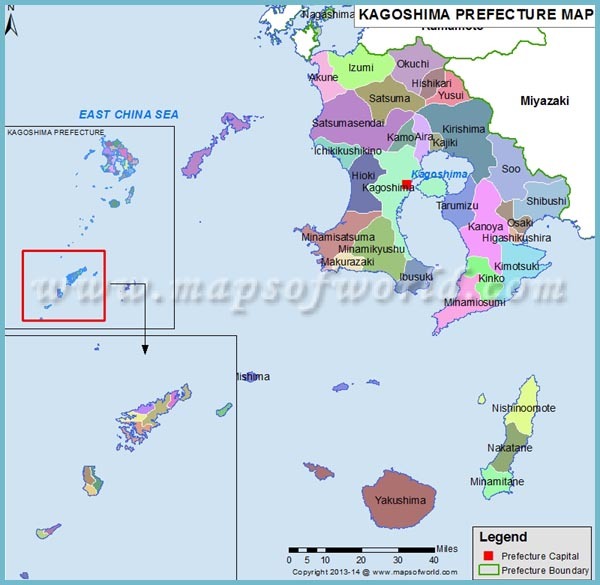 is one of the Satsunan Islands, and is the largest island within the Amami archipelago between Kyūshū and Okinawa. 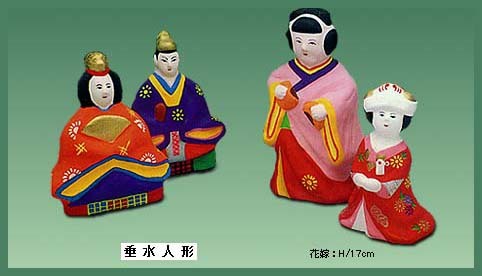 They have a tradition of more than 400 years, most probably first done by Korean potters. 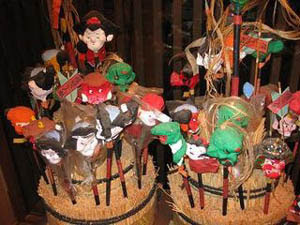 There used to be more than 40 craftsmen doing these dolls, but now there is only one left. 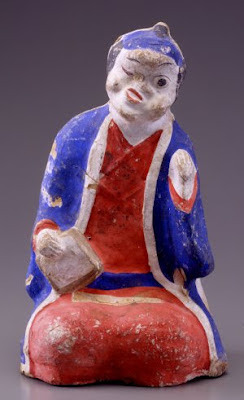 The dolls are made in a mold and are colored after firing.
. 武内宿禰 Takeshiuchi no Sukune - Takeshi-Uchi . 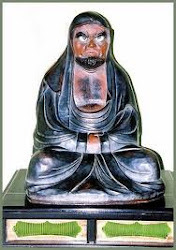 Lord Yoshihiro　義弘　had build the castle in Chosa (帖佐城 Choosa yakata) and then invited potters from Korea. The pottery was mostly of subdued colors, like black or brown. 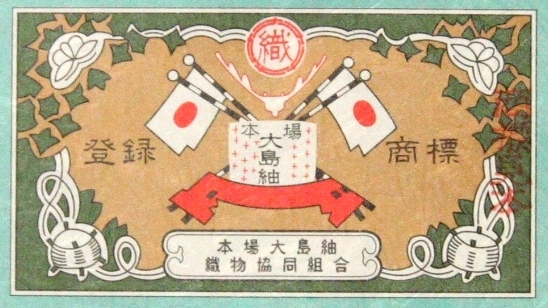 Yoshihiro used to stamp the pieces with a special seal to make sure they were of the same high quality and not forgeries. This region sees to have had strong ties with Korea since the Nara period. Naeshirogawa and Tanegashima ware from Kagoshima. The first guns arrived with the Portuguese in 1543 and their potential was quickly recognized, changing samurai battles considerably as strategy and tactics developed. Whereas archers were previously used first and foremost, the simplicity of the gun allowed the ashigaru foot soldier with limited training, to become a formidable fighting unit. The early weapons had an effective range of about 50 to 75 meters. Guns were now frontline weapons, often backed by archers, who were themselves backed by spearmen, ready to rush forward. Just 22 years after guns had arrived, Oda Nobunaga had proven their value in defeating Takeda Katsuyori at the Battle of Nagashino in 1575, when, according to legend, his 3,000 men in ranks of three provided a near continuous volley of fire at the approaching enemy, with devastating results. 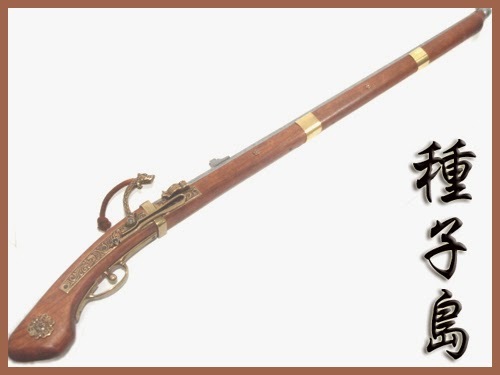 The matchlock, known as a "Hinawaju" or "Teppo" (some earlier guns were also known as Tanegashima, after the island upon which the first Portuguese had introduced the weapons) were of relatively simple construction, a steel bore fitted with a wooden stock. A priming pan on the right of the bore sat below a serpentine lever holding a length of saltpetre-impregnated cord. When the trigger was pulled, the spring-loaded serpentine dropped the slow burning cord into the priming powder in the open pan. Bang! The ashigaru were given either a small flask of gunpowder and a smaller container of priming powder, or pre-measured powder packs in paper tubes kept in a small box tied around their waist. This made recharging quicker, and so using the wooden ramrod housed in the gun’s stock to pack the powder and ram home the lead ball meant that all could be performed ideally in as little as 40 seconds. However, during the heat of battle, on damp or windy days, reloading a matchlock weapon would take significantly longer. It has been estimated that 25,000 matchlock guns, or 30 percent of all the guns in existence worldwide at the time were used at The Battle Of Sekigahara. In all of Europe, only 30,000 guns were believed to be in use. Japan had a total of approximately 55,000 of these projectile weapons, and in fact had more guns than any other country at that time.
. taiguruma 鯛車 sea bream on wheels . They are made by Kagoshima Takashi san, from sticky material made from paper. A kind of shiso ningyoo 紙塑人形 glued paper dolls. 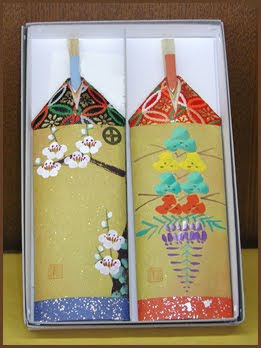 Paper is mixed with natural shoobunori 生麩糊 glue from wheat gluten powder. Mulberry fiber can also be used. 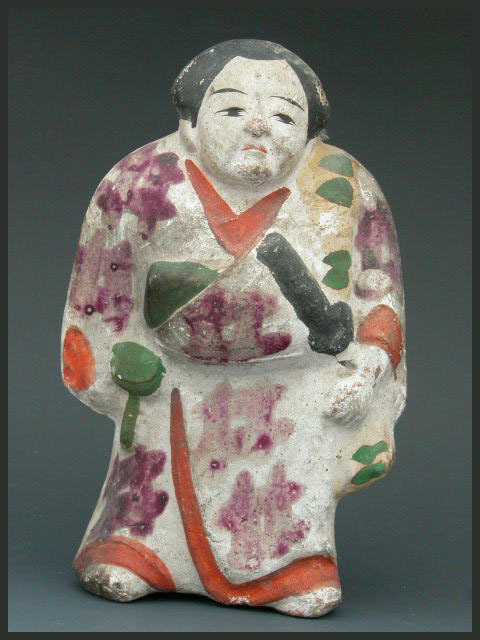 Dolls of this kind have a gentle touch, compared to plain clay dolls.
. shiso ningyoo 紙塑人形 dolls made from paper mixed with clay . They were first made in the Edo period. They are made from bamboo sticks and plates and have no face. A hemp string is wrapped around the head. This is a symbol and wish for the health and long life of the girl, usually the first daughter of a family. Many of the family members make these dolls by hand for the newborn baby and bring it as a present on March 3, the Hina Doll Festival. This custom declined after the War and even now many families had forgotten about it. After the revival they are now a famous souvenir from Kagoshima. Some can be used as bookmarks.
. itobina 糸雛 string dolls from Miyazaki . 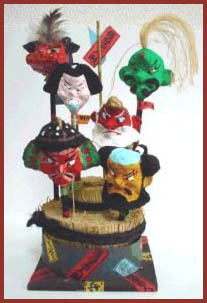 A present for the Boy's Festival in May to ward off evil. Last made by Hosoi Kimi san 細井ミキ, but now extinct. 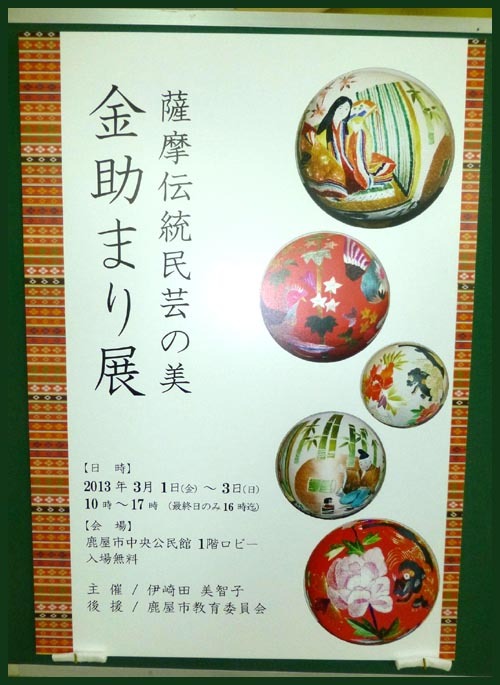 They are a present for the Girl's Festival in March, to hang down from above the Hina Doll exhibition shelf. The smaller one's are about 30 cm, larger one's can be up to 70 cm. 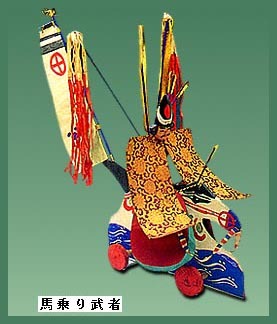 They come with auspicious motives, like the phoenix, peonies, Chinese lions, Pine-Bamboo-Plum 松竹梅, and others. It is a barn of a local farm that is constructed out of huge tree trunks and stumps that look as if it was put together by giants.
. ponpachi (hatsutsuzumi) 初鼓（ポンパチ）amulet paper drum .
. WKD - hatsutsuzumi 初鼓（はつつづみ）first hitting the drum . 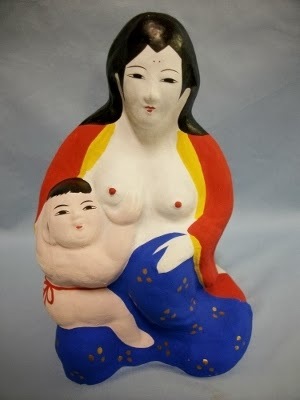 Made by the nephew of the Togo doll maker 榊畩次郎 Sakaki Kesajiro, named 松永仲次郎Matsunaga Nakajiro. Miyanojo is quite close to Togo. The dolls were only made about 10 years around 1930.
. tawara-nori rikishi 俵乗り角力 Sumo wrestler standing on rice bales . 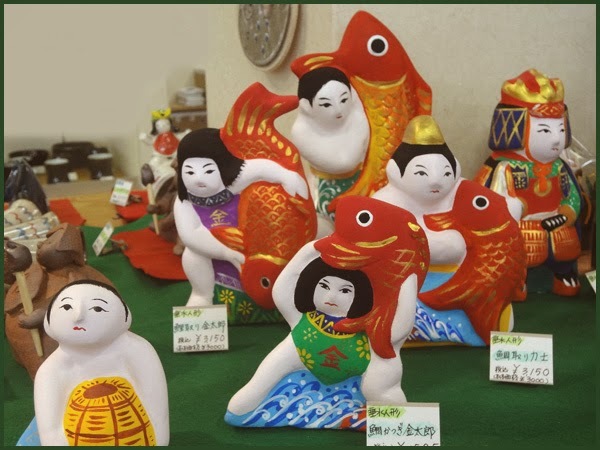 They were made since the beginning of the Meiji period by the 渡辺家 Watanabe family, in the tradition of the Sadowara dolls from Miyazaki and Chosayaki (see above). 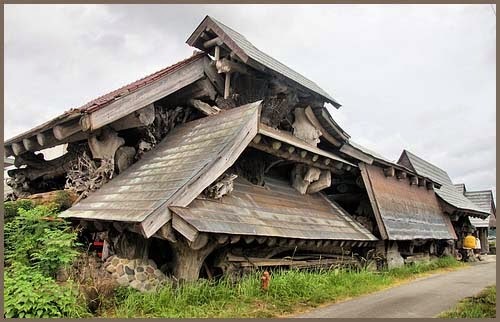 After WWII, they came into decline in the Watanabe family. Later, others tried to revive the tradition, like 中村信夫 Nakamura and 中島三郎 Nakajima. With more like-minded they started the workshop 夢創庵　Muso-An. When Nakamura san retired after about 40 years into the project, they founded the group 垂水人形研究会, which keeps the tradition alive. Nakajima san, a former school head master, started also to make stained glass art after retirement. Still active among others is 竹内宿禰 Takenouchi Skune, making all kinds of big clay dolls.
. Satsuma kiriko 薩摩切子 cut glass from Satsuma .
. Satsuma tsugegushi 柘植櫛 Boxwood comb. 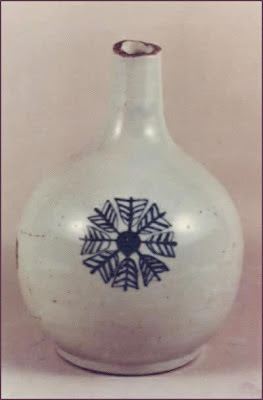 Satsuma ware is something between porcelain and pottery. Started around 1900 by 戸木田伊助, but disappeared around 1935. The earth used is thick and the dolls are strong. 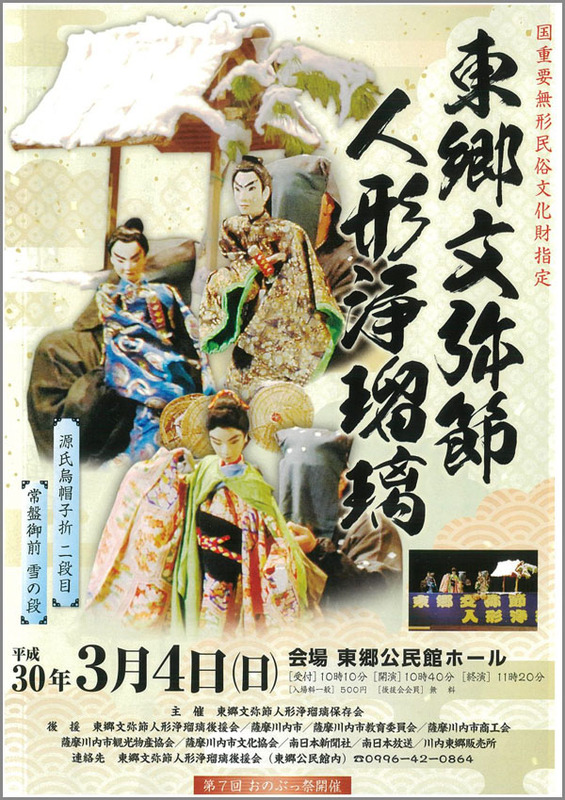 bunya-bushi, originally a storytelling performance by blind people. Now still performed in Sago, Ishikawa and Miyazaki. The repertoir is small, mostly "Tokiwa Gozen - yuku no dan", "Kurama kudari no dan" and "Sotobahiki".
. Kagoshima Folk Toys - this BLOG .